We were delighted to welcome a very special guest to our offices on Thursday, May 17. Christopher Legard - the High Sheriff of North Yorkshire - and his wife Miranda enjoyed a tour of our headquarters in Malton, met with Chief Executive, Dr Ava Easton and spoke with staff members as well as learning about encephalitis, an inflammation of the brain. The Society is close to home for Mr and Mrs Legard, who are the owners of the picturesque Scampston Hall, and his visit came only weeks after his appointment as High Sheriff. Whenever I have passed the office, I always thought it was nice that we had a regional branch of the Encephalitis Society in my home town of Malton. I was blown away by their work and also to discover this is not just the national headquarters, but the international headquarters of the charity. I was struck by the professionalism of the organisation and the wide scope of its work in providing support to people all over the world and furthering research into the condition. 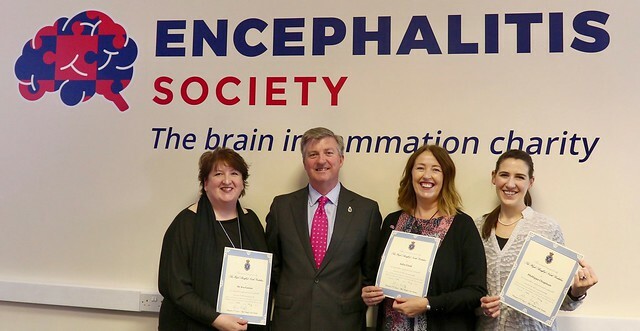 We were honoured to welcome Mr and Mrs Legard to the Encephalitis Society and to share our work with them and our vision of living in a world aware of encephalitis, its consequences and the support that is available to families.